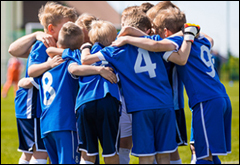 On 1 June, 2018, the Vatican issued a new document warning against the dangers of competitive children’s sports. CathNews has reported on this Vatican document which has cautioned against the dangers when athletes are pressured to ‘win at all costs’ and subjected to unsportsmanlike behaviour of fans. The document stresses the importance of ‘humanising’ sports and urged all Catholics to ensure that this is the case. The document identified what it believes are the main challenges of an obsession with sport, including the political and economic pressures put on athletes and the negative behaviour of spectators. The document also acknowledged the inherent benefits of children’s sport, recognising that sport can bring communities together in joy and celebration. Pope Francis applauded the document, which is the first Vatican document on the topic of sport, saying that sport can be a ‘rich source of values and virtues that help us to become better people.’ The Pope recalled his own fond memories of cheering on his favourite soccer team with his family when he was a boy. The document calls on the Church to remain committed to the wellbeing of all athletes in sports and to become involved in sports activities at a local level.